THE ENNIS BASED caver who took part in the heroic rescue of 12 Thai boys and their soccer coach said it was an “amazing miracle” that the boys were rescued and are now back with their families. At Shannon airport this morning, Belgian national Jim Warny received a hero’s welcome at the airport after a crowd of around 100 people applauded and cheered as he came through the doors at the arrivals hall. Flanked by his proud fíance, Asia Mania and his Dad, Rene, Warny told reporters, “We really didn’t expect that there would be such a good outcome. However, he said that it was “bittersweet” that Petty Officer First Class Saman Gunan “didn’t make it”. Warny said that “the true heroes of the operation are those boys who endured way more than us”. Warny’s fiance Mania said that the last few days have been ‘very stressful’ as she waited for updates around the rescue. She said, “It has been a nervous time. I truly believe that Jim knows what he is doing. I trust him in everything that he does – especially when he goes caving. I knew he would be back home. I can’t wait to drive home, close the door and be together. Warny was at the ‘front end’ of the rescue with a group of English cave divers and he confirmed that he personally carried out some of the boys trapped in the cave. He said that conditions in the cave were difficult “because of the added responsibility of having a human life attached to you”. The caver received the request for help last Friday and he said that after discussing the call with his fiance and family, he flew out Saturday morning. During his time in Thailand, Warny provided text updates to his nine year old son, Ciaran living back home in Ennis. On the rescue effort, Warny said: “It was a huge operation. It was a rescue with many teams involved from all over the world. The Thai people were heavily invested in it – they are such a nice and friendly nation. Commenting on the conditions inside the Tham Luang Nang Non cave, Warny said: “Conditions were certainly harsh. Visibility in the water was quite bad. A lot of parts of the cave weren’t flooded, you were diving, walking, swimming, waving. They are able to manage the risk and the stress and able to perform at the front end of the rescue. Warny said that he didn’t feel that his life was at risk at any stage of the rescue. 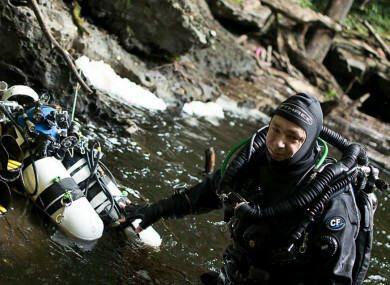 He said: “Cave diving and caving is something I do on a weekly basis. It is a highly dangerous activity. That is why we train. He said that it took a while to formulate a rescue plan “and once we had a plan it moved quickly out of necessity”. Fianna Fáil mayor of Ennis, Cllr Claire Colleran Molloy was the first to greet Warny as the caver and his supporters emerged through the doors at the arrival hall Friday morning. Wearing the mayoral chain of office, Cllr Colleran Molloy said: “It is wonderful that we have a good news story that gives us all a big happy smile. Cllr Colleran Molloy said that Warny through his heroic work “is bringing great happiness to our county and our town”. Philip Walker is a friend of Warny and a colleague in the Clare Caving Club. A Yorkshire man, Walker said that it was important to come to the airport “and see him home”. For further information on cave diving in Ireland, visit Irish Cave Divers on Facebook. Email “Clare diver who flew out to Thai rescue mission says boys 'are true heroes' as he lands home”. Feedback on “Clare diver who flew out to Thai rescue mission says boys 'are true heroes' as he lands home”.